There was no sign of conciliation in what Alexis Tsipras had to say to Europe. If anything, the rhetoric has hardened. The only constant in the ongoing Greek crisis has been a recurrence of delays. As the negotiations rumble on and on, the scale of Greece's problems are mounting by the day. Greece is running out of cash fast. The latest twist involves local authorities who have been ordered to transfer funds to the central government so that pensions and wages can be paid. This cannot go on and finally there is a realisation in Brussels that after all the talking, Greece must now decide what it wants to do. On Friday, Greece is due to repay €300m to the IMF. This is one of four instalments due to the IMF during the month of June, totalling €1.5bn. While this Friday's payment may be paid, there is little confidence that the totality of the payments can be made by June 19. Any one of the four instalments not being repaid could trigger a credit event for the country. On June 18, eurozone ministers will meet in Luxembourg. That is really the final date for a decision on Greece as that meeting comes just one week before an EU leaders' summit in Brussels. And the current bailout programme will expire at the end of June. Without a decision from the Euro Group, the body charged with negotiating a deal, it's very unlikely that a new programme can be put together. The simple truth is that Europe cannot lend more money to Greece unless a new programme with real commitments is in place. Without that programme, Greece will go under and quite frankly nobody knows the consequences of that for Europe or the international financial system. This time it is the end game, one way or another. If you were looking for signs of compromise from Greece, those hopes would have been dashed by reading the Greek prime minister's open letter in 'Le Monde' this week. 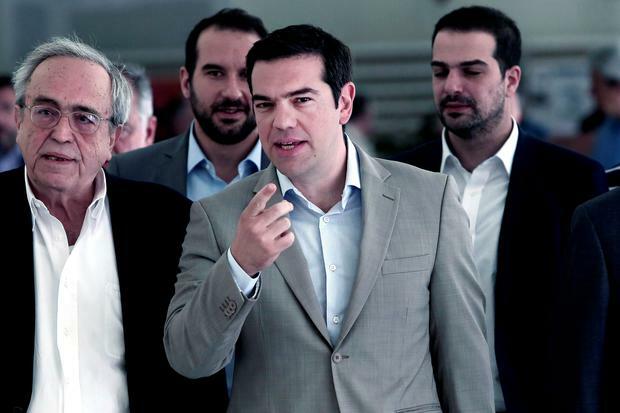 There was no sign of conciliation in what Alexis Tsipras (inset) had to say to Europe. If anything, the rhetoric has hardened. I'm reliably informed that the sticking points on any potential deal are around issues on pensions, labour law and VAT. Without movement on these key issues, there is no hope of a deal. What is now clear is that the promises made by Syriza in the most recent election were nothing more than populist nonsense. Similar to other populist parties in Ireland and elsewhere, Syriza pretended to the public that simply changing a government would magic away Greece's problems. Four months after that election, the problems for Greece are mounting on all sides. Some flexibility is needed from Europe. It is not in Europe's interest for this stalemate to continue. But equally the Greek government must recognise that the European taxpayer will not write blank cheques. We are talking here about public money. If Greece needs to refinance, it can only happen with public money, as private funding has since long gone. I recently listened to former Greek prime minister Antonis Samaras in the European Parliament and he asked MEPs not to support his opposition, not to support the current government but instead to support Greece and its people. As Mr Samaras said, it's time that the Greek people, rather than ideology, became central to this debate. But that time is running out fast. The blunt realisation for Greece is that the government will not be able to pay pensioners and civil servants within a matter of weeks if Greece does not unlock the final €7.2bn tranche of the bailout fund. The scale of the problem was exacerbated recently when the European Commission slashed Greek growth prospects for this year by 2 percentage points in the space of only three months, from 2.5pc in February to 0.5pc in May. Unemployment remains above 25pc. Despite the Greek crisis, the eurozone continues to grow. Recent weeks have seen a positive surge in European economic data and consumer sentiment across the EU. This seems to indicate that the fear of a Greece default is no longer holding back growth. And that's where the new Greek government is reading this all wrong. While nobody wants a Greek default, the truth of the matter is that if there is no agreement, ie a new programme, there will be default. That's the plan B, pure and simple. ECB president Mario Draghi recently warned that the global economy could be pushed into "unchartered territory" if there is no solution found with Greece. Many economists have said that a 'Grexit' will be difficult but manageable for the rest of the eurozone. But complacency should not come into this debate. The effects of the financial crisis should resonate with all EU leaders that "preparing for the worst" in crisis situations is always the sensible option. A 'Grexit' is a real possibility and it's time we planned for the worst. It should be in everyone's interest that Greece stays in the eurozone. We want to see them get through this crisis and there is clear support from European partners. But there will not be a deal at any cost to the European taxpayers. The creditor countries have limited room to make concessions. We should not forget that any new programme will have to go before national parliaments. The polls show that an overwhelming number of Greeks want to avoid Greece leaving the eurozone. Mr Tsipras and his government should start to realise that referring back to Syriza's electoral promises is no longer an option in these negotiations.